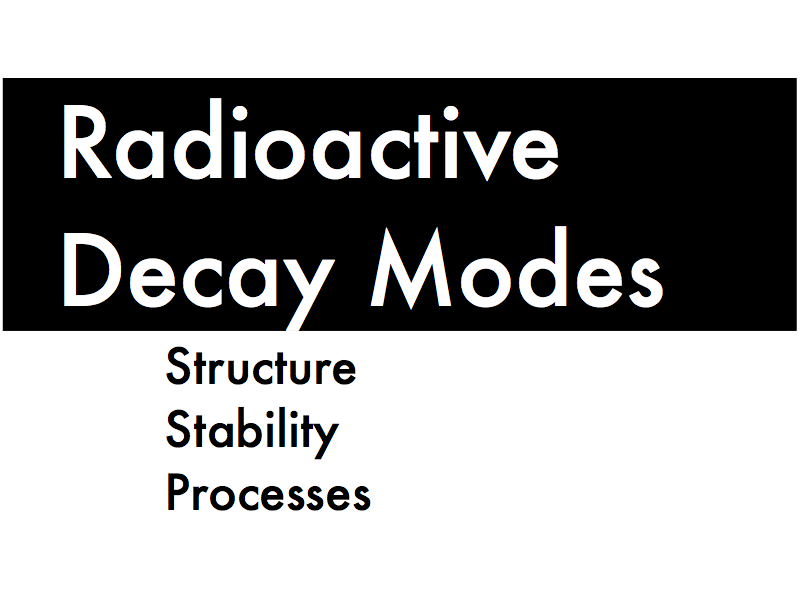 In this presentation we look into the causes of radioactive decays (compared to the previous presentation discussing the behavior of radioactive decays over time). 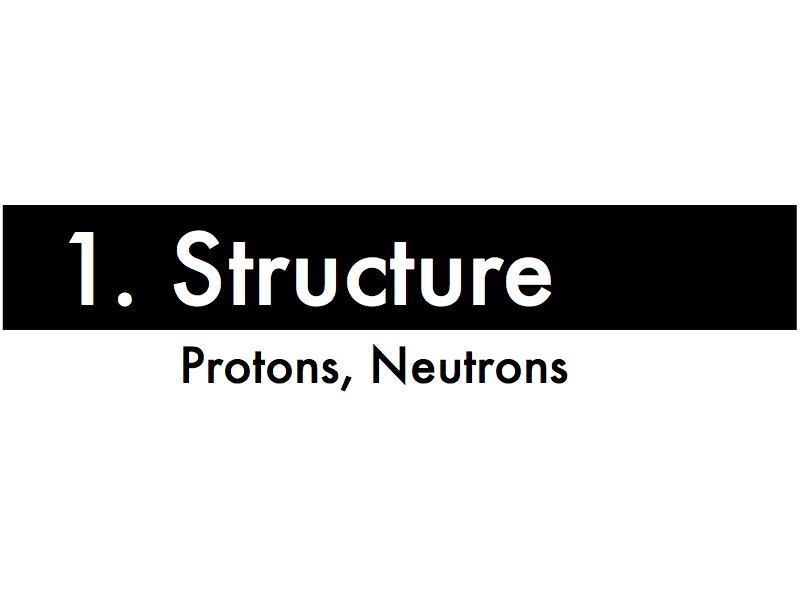 First, structure of atomic nuclei. Each nucleus, whether stable or unstable, contains a set number of positively-charged protons and neutrally-charged neutrons. From chemistry, the specific element is denoted by its chemical symbol, and (somewhat redundantly) the atomic number of the element denotes the number of protons in the nucleus. The nucleon number denotes the total number of nucleons (protons and electrons), such that the number of neutrons is the difference between the nucleon number and atomic number. 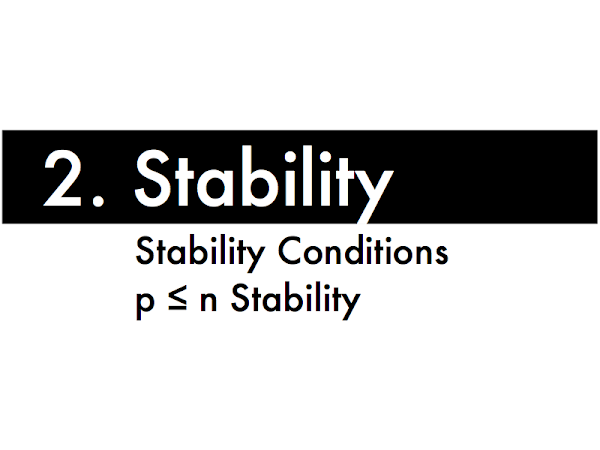 Second, stability and instability of nuclei. For all atomic nuclei, big and small, the key to stability is being able to keep the protons in the nucleus together, in spite of them all repelling each other. Having a certain number of neutrons in the nucleus will mitigate the proton-proton repulsion, and not just merely by spacing apart the protons. A nucleus containing more than 83 protons will always be unstable, no matter how many neutrons there are, as there is just too much proton-proton repulsion. For a nucleus with 83 or fewer protons, having too few neutrons than protons will be unstable. Also having too many neutrons than protons will also be unstable. But having the proper ratio of neutrons, approximately equal to or slightly greater than the number of protons, will make the nucleus stable. The model of why neutrons are critical for keeping a nucleus stable is that there is a "strong force" that "sticks" nucleons together. This is an attractive, short-range contact force--think of velcro--that balances out the repulsive forces between the protons in a nucleus, and is a fundamentally different type of force than those covered in this course so far (gravitational forces, electromagnetic forces). Related to the weirdness of the strong force is that a proton (which is intrinsically stable) can be transformed into a neutron, and vice versa (through processes we'll discuss later). Even more weird is that a neutron is intrinsically unstable--an isolated neutron outside of a nucleus has a half-life of 10.2 minutes, and will eventually decay back into a proton. Think of a stable nucleus as having protons continuously transforming into neutrons, and neutrons continuously transforming into protons, and as they are transforming back and forth into each other, the strong force "sticks" them together, balancing the repulsive force between protons. An unstable nucleus, then, also has protons transforming into neutrons and vice versa, but the wrong ratio of protons to neutrons does not optimize the amount of proton-neutron transformations--and thus strong force "stickiness"--that would balance the repulsive force between protons, such that the nucleus will eventually need to somehow undergo a process to reach a more stable configuration, whether by falling apart (fission), or ejecting small parts of itself, as in the modes of radioactive decay discussed below. 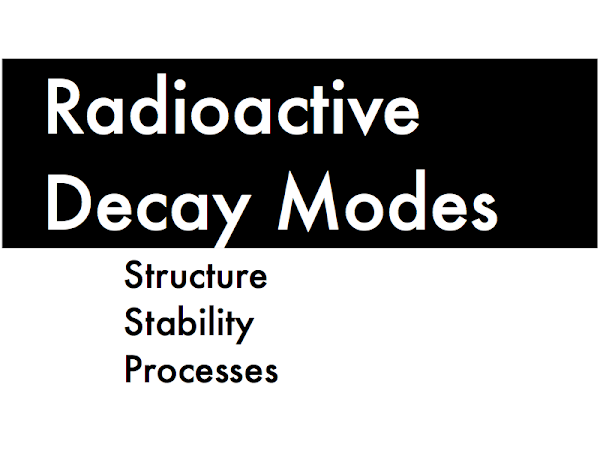 Third, the different processes that unstable nuclei can undergo to achieve more stable configurations, and applications of these different types of decays. 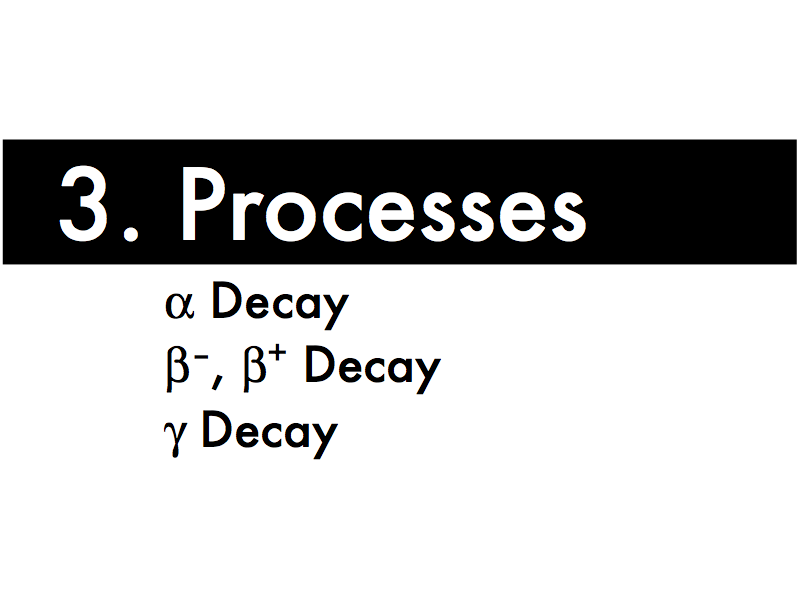 Alpha decay is how a nucleus with way too many protons achieves a more stable configuration. This is observed to happen by ejecting a blob containing two protons and two neutrons--thus, a helium nucleus--which reduces the number of protons in the nucleus, and this may occur a number of times as long as there are more than 83 protons in the nucleus. Americium-241 (unstable americium with 241 nucleons: 95 protons and 146 neutrons) is used in a ionizing smoke detector, as it gives off alpha particles as it decays, and these positively charged particles are used to complete a circuit. 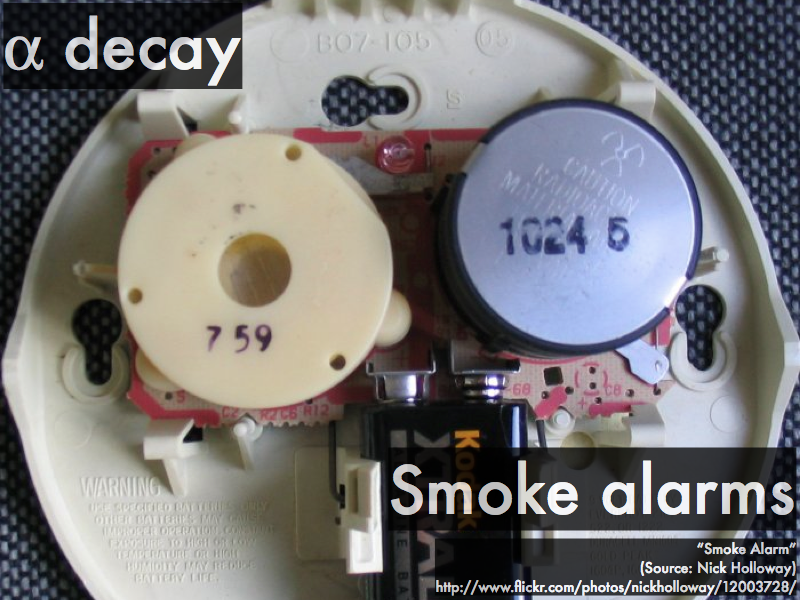 Particles of smoke will also attract the alpha particles, and the presence of these in the vicinity of the detector will disrupt the flow of current in the detector, setting off an alarm. Beta-minus decay is how a nucleus with too many more neutrons than protons achieves a more stable configuration. This is observed to happen by transforming a neutron into a proton (thus reducing the number of neutrons while increasing the number of protons). This transformation emits an electron--historically called a "beta particle" in the context of radioactivity--and a small, neutral particle called an antineutrino. Helium-3 ("tritium," unstable helium with three nucleons: two protons and one neutron) is used in materials that glow in the dark without needing to be first exposed to sunlight. So instead of phosphorescent paint being conventionally excited by ultraviolet light, it is instead continuously excited day and night by the energetic electrons given off by the tritium as it undergoes beta-minus decay. 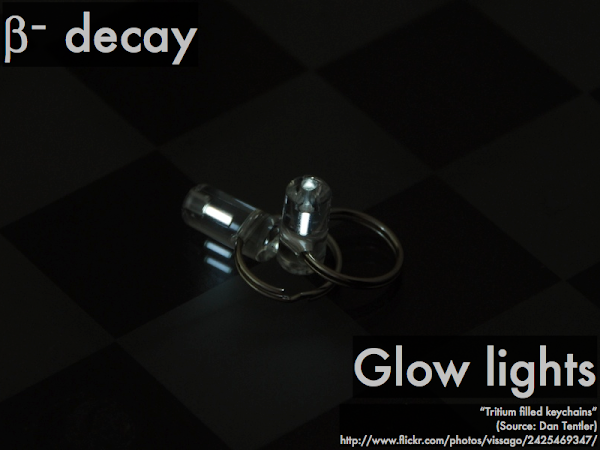 Beta-plus decay is how a nucleus with too few neutrons than protons achieves a more stable configuration. This is observed to happen by transforming a proton into a neutron (thus reducing the number of protons while increasing the number of neutrons). This transformation emits a positron--which is a positively charged antimatter "twin" of an electron--and again a small, neutral neutrino. Fluorine-18 (unstable fluorine with 18 nucleons: nine protons and nine neutrons) incorporated in sugar molecules is ingested by patients undergoing a positron emission tomography (PET) scan. The sugar molecule can be configured to be metabolized only in certain tissues, and will then give off positrons in these regions as the fluorine decaays. When an antimatter positron immediately runs into the first matter electron it encounters, this antimatter and matter pair will annihilate each other and give off two high energy photons that move off in directly opposing directions. By detecting and triangulating the specific regions in the body that keep emitting the pairs of photons from positron-electron annihilation, a three-dimensional metabolic map can be constructed. 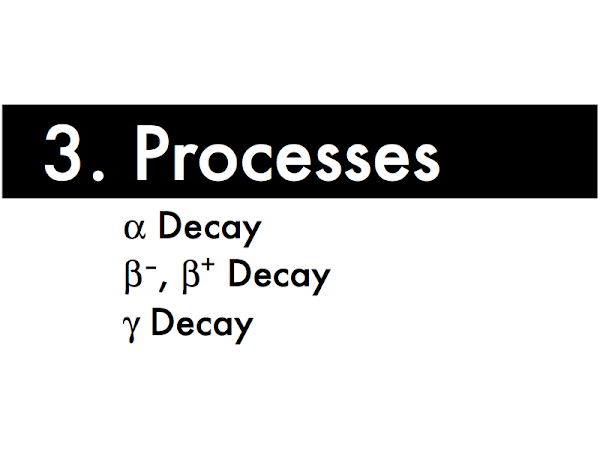 Gamma decay is how a nucleus achieves a more stable configuration, but not because it has too many protons, or the wrong ratio of protons to neutrons, which is what alpha and beta decays allow. After a stability-achieving alpha or beta decay, the nucleons in the nucleus may all still be too energetic, and can shed the excess energy in order to "calm down" by emitting a high-energy photon--historically called a "gamma ray" in the context of radioactivity. Gamma rays are the most highly energetic type of photons, even more energetic an x-rays. 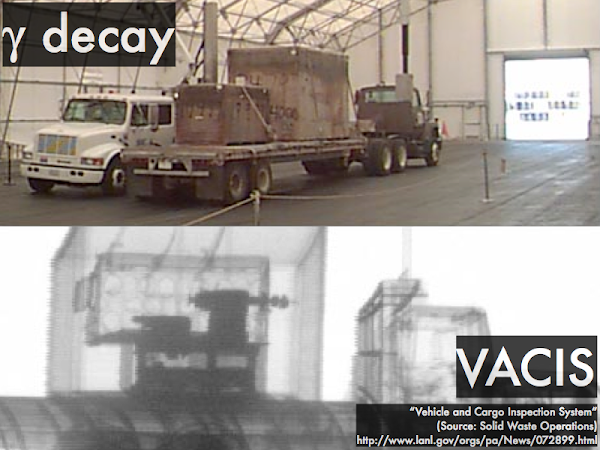 This allows them to penetrate through thicknesses of metal that would be opaque to x-rays, allowing inspection of the interior of metal machine parts and shipping containers, as is done in mobile scanning unit.